Valerie and Blake Nicholson aren’t just the owners and operators of TapSnap 1073, they are also proud parents to three sons. Together, they aim to build a flourishing family business and to bring the excitement of TapSnap to the local community in the Austin area. We sat down with the couple to find out how they make their business thrive. Valerie: We found TapSnap through a franchise website and it stood out clearly among all other opportunities that we had considered. Specifically, the fact that the investment was within our budget and the business could be operated from home - these were some of the major benefits of buying a franchise with TapSnap. Plus it looked like a ton of fun! Blake: We both have a strong background in sales, but neither of us had owned or operated our own business before. 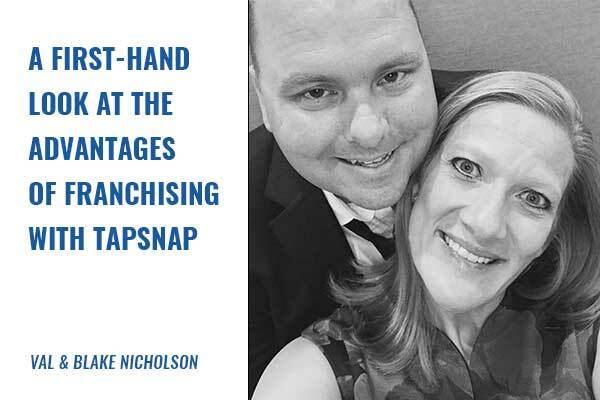 One of the advantages of franchising with TapSnap is that they provide a network, and have systems in place that have helped to propel us forward quickly with a focus on revenue generation. There was no need to develop products, create marketing materials, or any of the other important details that are needed to ensure success— it was all provided upon entering the business. If you’re curious about the key roles and responsibilities for both parties, here’s more on the franchisor and franchisee relationship. What were you doing before you decided to become franchise business owners? Valerie: Before TapSnap, Blake was focused on keeping up with our three sons— ages 3, 7, and 9, while I was busy with my work-travel schedule. I roamed the state selling educational technology while Blake held down the fort. Blake: The challenges were minimal but usually related to more of the administrative side of the business (translation: keeping up with the not-so-fun parts). We also serviced every event together that first year (aka “date night”) but quickly realized that we needed employees. We’ve since hired some amazing university students and can pick and choose where they go. Blake: Landing the first big (annual) contract with a major brand was a very positive experience. It happened early on in the business, and that single relationship and reference account has led to so many other customers and events! Valerie: I have a passion for community events, especially when I can help to engage a sponsor with a local non-profit to create a win all around. Blake likes those but gets really revved up at the many sporting events in our area. This is especially true at the University of Texas! Blake: We both did not anticipate growing our professional and personal networks as much as we have over the course of the past three years. We’ve grown as individuals right along with our networks, learning a lot about ourselves and our business. Blake: It’s totally worth it to hire energetic young people and build a TapSnap team as soon as possible. Valerie and I agree that we could have accelerated our business sooner if we had both been focusing on TapSnap full-time as there is a great amount of synergy and momentum to be gained through collaboration. Valerie: The TapSnap experience is truly unique, even with the competition we see in the market. Anytime we’re feeling down, Blake and I will attend an event to see those eyes light up and to soak up all the positivity. What are your secrets for success and what advice can you give to new franchisees entering the business? Valerie: Blake and I have built strong partnerships and a loyal customer base, most of which are business or non-profit organizations that book our services 3+ times per year. We don’t chase every bit of business in our market—it’s all about quality over quantity! We also love to leverage successful events and activations which we’ve found to be very valuable for our business. If you’re still in search for the right fit, this franchising guide and resource list will certainly come in handy! TapSnap has franchise opportunities available, but don’t wait to reach out if you’d like to operate in a specific location. To learn more about the advantages of franchising at TapSnap, take a look at our Franchise Information Report or call us at 1-877-577-0566!